After assigning a task, a notification is sent to the Kazeli inbox of the assigned Team Member. The last task was assigned to yourself, and you the task notification should now be available in your Message Center. 2. Click on the Red color coded task notification to open the task. 3. Click the task to open it. When you create a task, Kazeli allows you to create an event in your calendar directly from that task. In this way, as well as showing up in your tasks list and Message Center, you can also view the task in your calendar and set a reminder. 1. 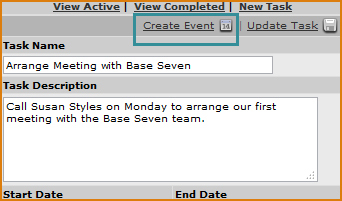 With the Task open, click CREATE EVENT. 2. 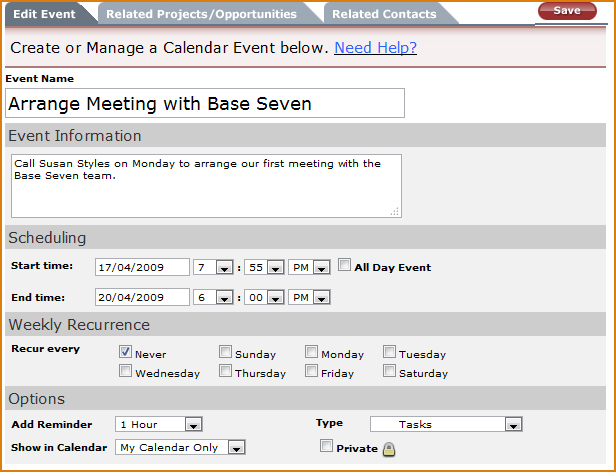 The event Name and Description will automatically be filled in with the corresponding task fields. Choose a START and END date. By default, these will be filled with today’s date. As calendar space will be reserved for every day in between the start and end date, you should consider whether you would like to use the Create Event from Task feature only for tasks that will be completed within a day or two, unless you would not mind the task appearing in your calendar for an extended period.